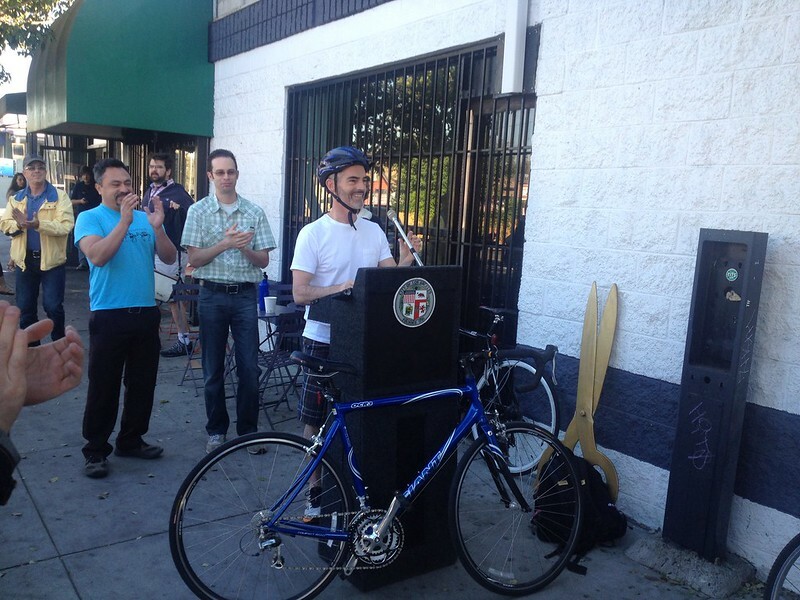 Councilmember Mitch O’Farrell speaks about the economic and safety benefits of the new Virgil Avenue bicycle lanes. LADOT is pleased to release the cumulative list of Year 2 planned bicycle lanes. See the list below for the street name, council district and the respective mileage and limits of each project. This Year 2 list contains the next 40 miles of bicycle lanes prioritized for installation. Each project is part of an ongoing effort to strategically close gaps in our bikeway network by connecting new infrastructure to existing bicycle paths, lanes and routes in Los Angeles. A number of these projects are funded through the Highway Safety Improvement Program (HSIP). Moving forward, LADOT will begin traffic and safety assessments for the Year 2 projects. Results from this analysis will be made available in a public report. 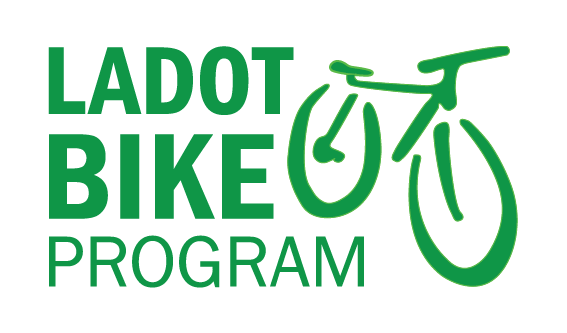 Upon completion of Traffic and Safety Assessments, LADOT and the Department of City Planning will hold a series of public hearings to disclose the analysis and give interested groups an opportunity to express their support or concern over the proposed bicycle lanes. 2nd St. bike lanes are on their way! City Planning’s David Somers filled us in a couple of weeks ago on the release of the draft EIR for the First Year Bicycle Lanes project. While AB 2245 exempt bicycle lanes from CEQA, it still requires a public hearing process and traffic/safety assessments in order to file the exemption. 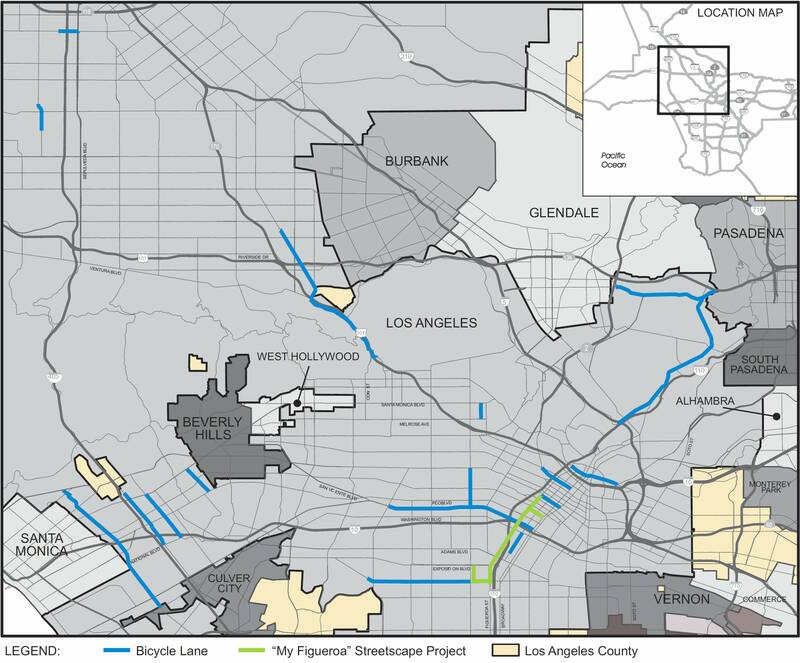 As a refresher, the First Year Bicycle Lanes project includes the city’s first protected bicycle lanes as part of the MyFig streetscape project, a continuous bikeway from Hollywood through Silver Lake and Echo Park to Downtown, and strategic gap closures in the existing bicycle lane network. Somers also discusses the approval process going forward in another blog post. Make sure to attend the meetings and have your voice heard on this exciting process. 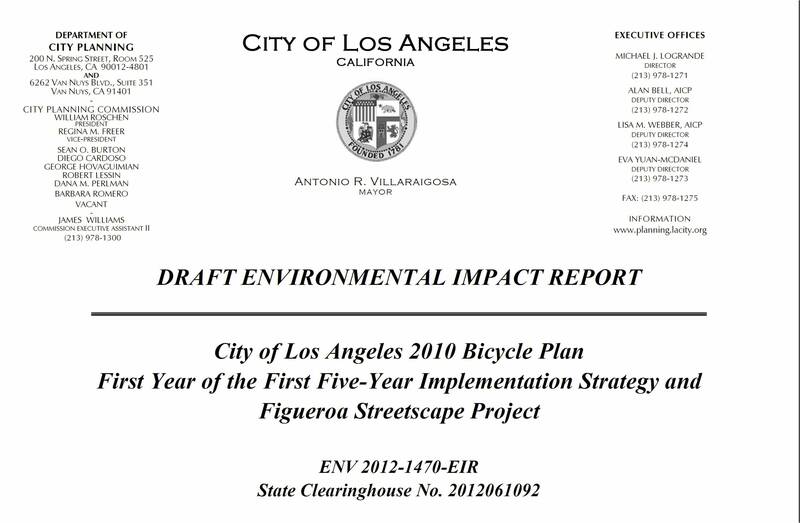 The Draft Environmental Impact Report (EIR) of the First Year of the First Five-Year Implementation Strategy (First Year) and the Figueroa Streetscape Project was released to the public on Thursday, January 17th. As all proposed bicycle lanes included in the First Year Draft EIR include the reduction of at least one mixed-flow travel lane, the main focus of the Draft EIR is the projected increases in travel delay (expressed in Level of Service (LOS)) anticipated as a result of the reduction in auto flow capacity. The result of the LOS analysis can be found in the Traffic Section of the Draft EIR (see Table 4.5-5). A stand alone Traffic and Safety Assessment was also released for one mile of bike lanes along Sunset Blvd. west of Figueroa St. The Sunset Blvd. 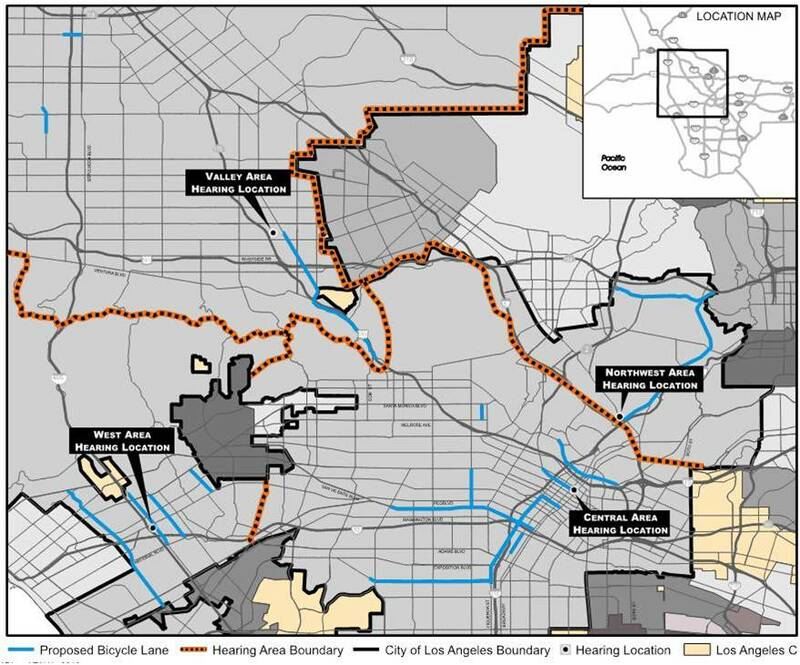 bike lanes were recently proposed and will for the first time provide a direct connection to the neighborhoods of Hollywood, Silver Lake, and Echo Park to Downtown by a continuous bikeway. The City Planning Department has scheduled four public hearings to hear public comment on the First Year bicycle lanes. The projects include the nearly 40 miles of bicycle lanes that were evaluated in the recently completed Draft EIR in addition to one mile of bike lanes along Sunset Blvd. west of Figueroa St. 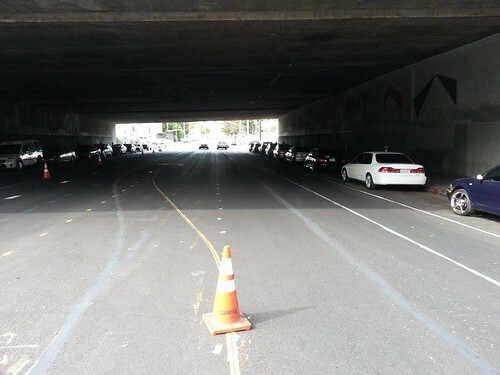 The 40 miles of bike lanes include the first proposed protected bicycle lanes or ”cycle tracks” in the City as part of the MyFig Streetscape project, as well as strategic gap closures such as Venice Blvd. along with the introduction of critical bikeways in all major geographies of the City. The Sunset Blvd. bike lanes were recently proposed and will, for the first time provide a direct connection to the neighborhoods of Hollywood, Silver Lake, and Echo Park to Downtown by a continuous bikeway. The Traffic and Safety Assessment for the Sunset Blvd. bike lanes is available here. BPIT participants discussing Neighborhood Council communication. 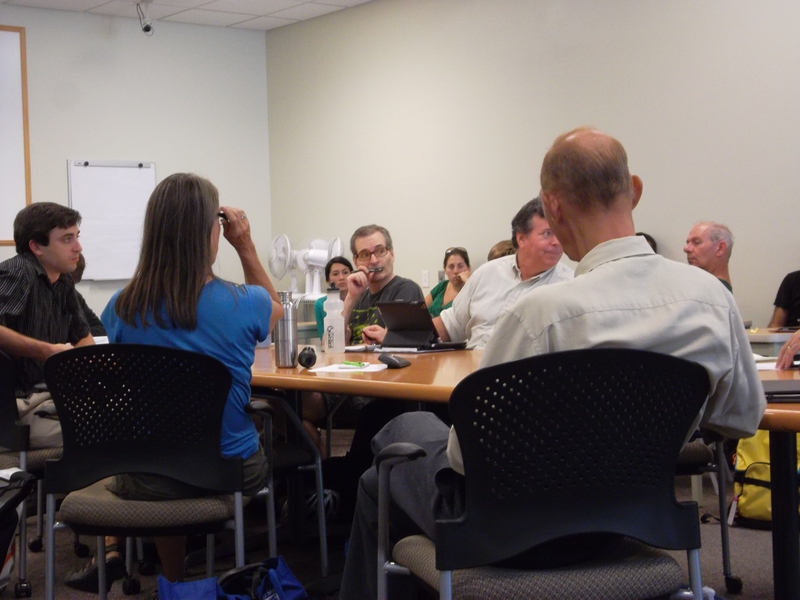 This past October 2nd, the Los Angeles Departments of City Planning (LADCP) and Transportation (LADOT) held their quarterly Bicycle Plan Implementation Team (BPIT) meeting. Over 20 people were in attendance, ranging from city employees from various departments, representatives from city council offices and several bicycling organizations, to many bicyclists and residents intrigued to see where bike infrastructure in Los Angeles is heading.